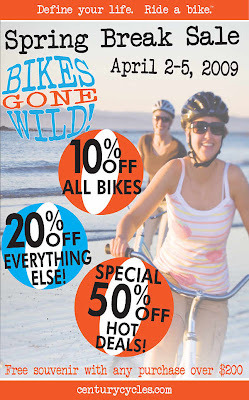 Century Cycles Blog: Biggest Sale of the Year Starts this Thursday! Join us this Thursday, April 2 through Sunday, April 5, 2009 for our Spring Break Sale! Bikes Gone Wild! At least 10% OFF all bicycles - select models marked down even more! At least 20% OFF all parts and accessories! Take Home A Souvenir - FREE Century Cycles t-shirt, pub glass, or coffee mug with any bicycle or purchase over $200! Beach Blanket Bargains - most at 50% off the original price! Oh, oh. Someone better take my credit card away... I already see a few things I need... (and, yes, I NEEEEEEEEEEEED them).